Innovative Mobile Data Capture Platform for companies large & small. InFormed enables our customers to use smartphones & tablets to better communicate with their people. Using our web-based software, customers can quickly build powerful, dynamic mobile applications without any programming. InFormed can be used to create all kinds of applications across a variety of industries, from simple proof-of-delivery forms to complex risk assessment documents. Take a photo, capture a customer signature, email a quote - all directly from a mobile device. Mobile users get direct access to your customer names and addresses, product lists and prices and any other data you care to include in your application. The app also works off-line and automatically syncs with our server when it can. Results are instant and measurable, allowing organisations to make quick, InFormed business decisions. InFormed makes it quick and easy to create all sorts of documents directly from a smartphone or tablet. Mobile users get a simplified interface to quickly enter data which is then seamlessly merged into your branded PDF or Word documents by our system. The office can track each transaction via our web portal and support their mobile workers as needed. No more clipboards. No more paper. No more manual data entry. Send us your paper forms and we'll show you how quick and easy it is to make your business more efficient by completing them from a mobile device. Spreadsheets and text files can be simply added to your InFormed Apps - price and parts lists, vehicle registrations or any other data can be quickly added to your solutions. These Lookups are stored securely on the mobile devices so can be used off-line in the field to quickly and accurately enter data. Data files can also be stored on an FTP location ensuring the field is always using fresh data. 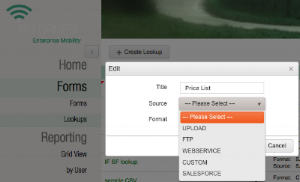 InFormed has a pre-built connector with Salesforce.com. This enables InFormed users to access any data directly from Salesforce.com, and then write back a completed PDF or Word document into SalesForce.com. InFormed can also be configured to connect with many ERP and CRM systems. For the more technical amongst us, InFormed has a RESTful web service interface which enables the creation of real-time apps connected to your systems. The InFormed Integration module can be configured in minutes to send data from our Cloud portal to a customer's data centre. These integration jobs can be scheduled as needed and can use FTP, sFTP or email protocols. Need to get your workers' attention? Tired of missed emails or ignored text messages? Our new NOTIFICATIONS module allows our customers to communicate with their users via Instant Notifications. These notes popup on a user's SmartPhone immediately prompting them into action driving efficiency and transparency between HQ and mobile workers. Notifications can be sent to a single user or group of users and can be configured to recur as needed. For example, "send a Health & Safety notification to all store managers every Monday morning at 8am". Users automatically receive the notification at the required time and fill in the linked form. The results of completed forms are instantly viewable via our web portal. InFormed dashboards present data captured by InFormed apps in a clear, easy to understand format. Dashboards can be presented on a map, in tables, charts or a combination of formats to suit the application. Dashboards can calculate and display Key Performance Indicators such as audit trends, results and exceptions and are interactive so users can drill-down to quickly find the information they need. Dashboards are real-time, so always show up to date information as it is being submitted from the field. The combination of InFormed Apps & Dashboards is a powerful proposition; our clients can deploy personalised, data-rich applications to SmartPhones and tablets in minutes, without any programming, and view the results in an interactive dashboard. This can help drive automation and productivity, increase revenues through sales effectiveness and drive compliance across an organisation. Want to know more? Get in touch and we'll show you a personlised demo. Creating smart, integrated mobile applications for your company doesn't have to be hard. Tired of elongated IT projects? Getting InFormed into production is a quick & easy low-risk process. Start small with a departmental solution and then roll-out across across your organisation. InFormed empowers business people to create mobile solutions. Give it a go, it's easier than you think.